These blueberry cobbler overnight oats are loaded with blueberries and topped with a crunchy, gluten-free crumble. It’s like having a dessert for breakfast, but still healthy! Remember that time I took leftover berry cobbler and made overnight oats out of it? Gah, it was so delicious! I would have it for breakfast every morning if I could. Sadly it’s not too often that I have cobbler sitting around. 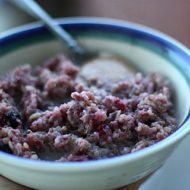 I decided to remedy this situation by recreating a version of blueberry cobbler overnight oats that can be made any day of the week. No leftover cobbler necessary. It was actually easier than I anticipated and turned out to be just as tasty (and much prettier) than the original version. Just in case you’re new to overnight oats, here’s the quick and dirty: Overnight oats are simply old fashioned, rolled oats (not instant) that soak up liquid overnight in the fridge. You can use any type of liquid you’d like. My favorite is almond milk because it makes the oats extra creamy. To give the oats a boost of protein I like to add Greek yogurt or protein powder to the mix. For this recipe I used brown rice protein powder instead of yogurt to keep it dairy-free. When you take the oats out of the fridge in the morning, you give them a stir, top ‘em with whatever toppings you’d like and dive in. There’s no cooking required, which makes them quick and easy — perfect for weekday mornings! You can keep your overnight oat toppings simple or you can go all out like I did for this blueberry cobbler version. Do you see that crunchy, golden crumble on top? It’s perfection. Everyone knows the best part of cobbler is the topping — same goes for these oats! The overnight oats are good (I love the hidden blueberries in there), but the crumble topping is where it’s at. Don’t let the simple ingredient list of oats, oat flour, organic cane sugar, sliced almonds, cinnamon and coconut oil fool you. 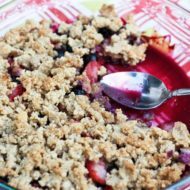 Once combined it hardens up a little and makes for a sweet and crunchy topping, similar to what you’d find on top of a blueberry cobbler. 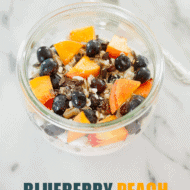 These overnight oats are loaded with blueberries and topped with a crunchy, gluten-free crumble. It’s like having a dessert for breakfast, but still healthy! Place all ingredients (besides those for the topping) in a container and stir until well combined. Seal with a lid and place in the fridge overnight. Bring out of the fridge in the morning and stir. You’ll notice that the protein powder, oats and chia seeds soak up a lot of the liquid so you may want to add a little more almond milk before serving. Portion overnight oats into two containers, top each with the crumble topping and a few extra blueberries. Enjoy! This sounds great with almond milk, yum. And lovely pics! Oh man this looks so yummy! Blueberries are one of my favorite foods! Yum! This looks absolutely incredible! I pinned it immediately after first seeing it. This would be the ideal breakfast to wake up to! I’ve been buying berries like crazy too!! 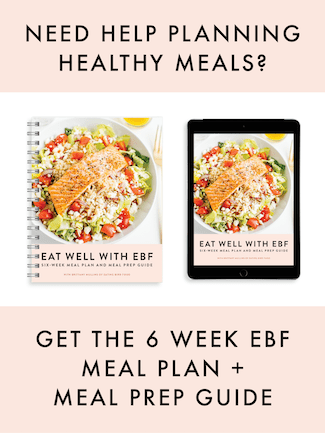 I don’t typically comment on blogs, but this blog used to be one of my favourites! I’m not sure if other people are finding this too, but I find lately the amount of advertising and sponsored posting is annoying. I understand that advertising and sponsorships are an essential part of monetizing a blog, and obviously getting free stuff to try out is fun, but I really do think the quality of blog content had suffered lately as a result. In the end this is just my opinion, but I thought I would let you know that I am visiting the site less as a result. Sorry! This was so yummy!! I’m going to try it with strawberry next. So glad that you liked it! Let me know how the strawberry turns out.